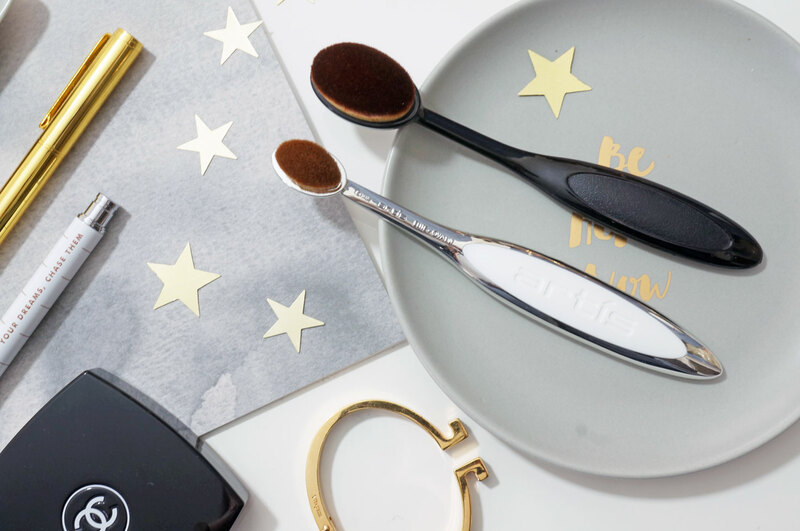 If you’re a fan of watching youtube tutorials, you may have noticed some rather odd looking makeup brushes popping up of late – kind of like a spoon but with a brush head at the end! These are Artis brushes, and it seems like plenty a Youtuber swears by them now. 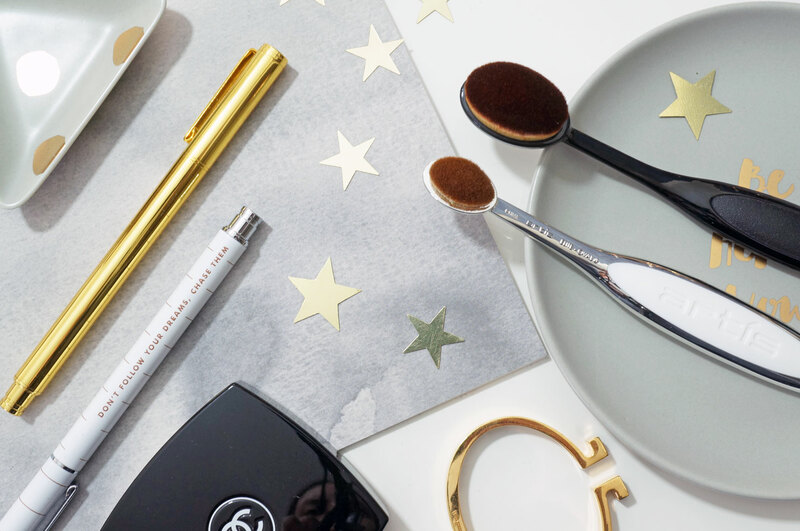 Unfortunately though, these brushes are not cheap by anyones standards – single brushes start from £25, and if you fancy splurging on the full set, ten brushes will set you back an eye-watering £280. So what’s so special about them? Well they have a unique forward facing head, kind of like a toothbrush, and it completely changes the way you apply your makeup. As well as that, the bristles are a worth noting too, the CosmeFibre® trademarked bristles are created using high-tech machines that produce completely consistent, man-made fibres. Each fibre has a microscopically tapered end, which Artis says allows for more consistent application. So basically I really wanted to try these brushes out, to see if they’re really as good as they sound. The price did put me off though, and as I don’t actually need any more makeup brushes right now, so I couldn’t justify picking up the full set. Then, something magical happened and I noticed some very similar brushes on ebay, for a fraction of the cost – and when I say fraction, I mean a tiny fraction. So I did what any good beauty blogger would do, and I bought just one of the Artis brushes and one from ebay so I could compare them. So I ordered the Artis Oval 4 brush, which was from Space NK, and this arrived first. This brush is designed for use on and around the eye area, so you can use it for applying eyeshadow, or for concealer. I then found an identical looking brush on ebay, it looked like it would be bigger than the Artis Oval 4, but at that point in time I couldn’t see any other size options. I thought it would be worth a punt though, so I ordered it and waited patiently for it to arrive. When it landed on my doorstep a few weeks later, I compared it to my Artis brush and you can see it really is quite a lot bigger. I’d say it’s counterpart would actually be the Artis Oval 7 brush, which is £48 – and I really didn’t want to pick up another one at that price, so I thought I’d persevere and compare them anyway! So on first look, the Artis brush is definitely more visually appealing. It has a high shine chrome finish, with a white embossed section for easy grip featuring the Artis logo. It also comes in an expensive looking box too. The ebay dupe on the other hand, has a black glossy finish, with no branding and no box, this one just came in a clear cellophane wrapper. The fibres of both brushes are SO fine, I don’t think I’ve seen anything like them before. The fibres are completely uniform and flexible on both brushes, and both brush heads have been shaped to a curve, so they move easier over the contours of the face. As mentioned before, the Artis brushes use their trademarked CosmeFibre synthetic bristles, and it’s interesting to note that each of their brushes has on average 3 to 10 times as many individual fibres as conventional animal hair brushes – which Artis promises results in superior blending and smoother makeup application. 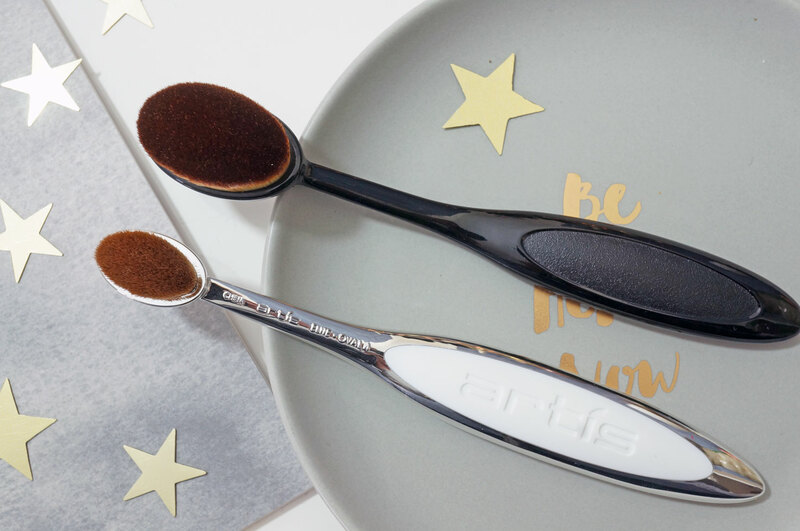 Even though the bristles on both brushes are man made, the Artis brush fibres have a more natural feel, with the ebay dupe feeling more silky and synthetic. 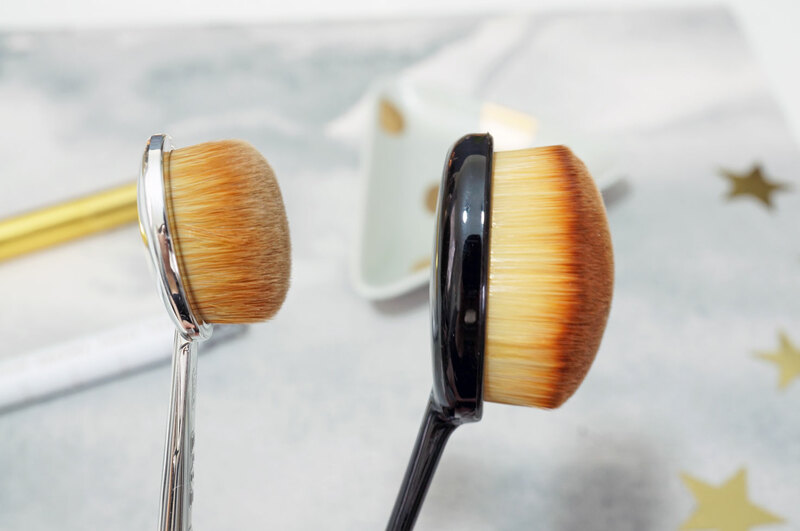 Both are equally densely packed into the brush head – the density really is an important factor as you lose less product into the brush when applying it to the face. I decided to try both brushes with a powder and also with a liquid foundation just too see what would happen, and it turns out the brushes are very similar indeed. When applying both powder and liquid foundation, they both spread the product easily, and glide over the surface of the skin to give an even finish. I found the Artis brush worked really well on the eye area due to its size, and the ebay brush was a bit too big for the eyes, but this worked well for the cheeks and forehead. One think I love about both brushes, is due to the bristles being packed so densely, they take in less product, so you don’t need to use as much product to begin with – you’re actually saving money by using them! And now for the prices. So the Artis brush was £32 – ouch. But how much would you say the ebay dupe was? Well this brush cost me £1.18, including free shipping from Hong Kong. At the time of buying this, I couldn’t see any information on other sizes available, but I’ve checked again and I’ve found a UK seller offering a set of 10 brushes for £18.86, which really is a bargain, you can see the set here . 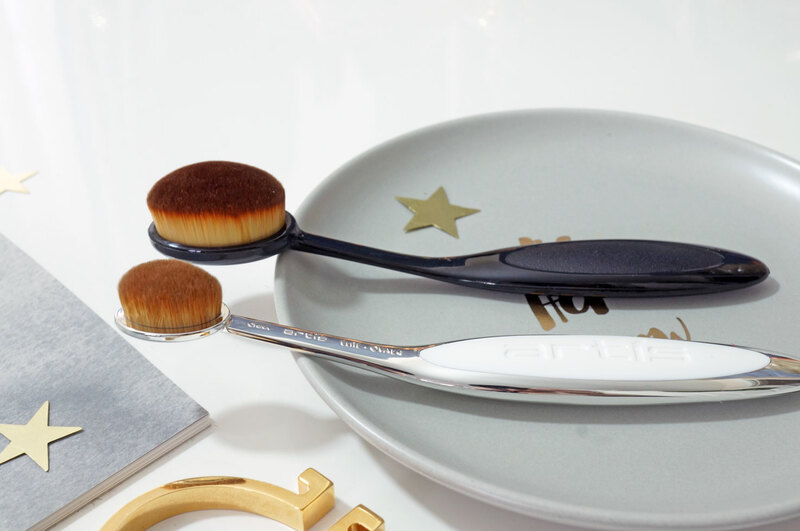 They may not have the fancy packaging or branding of the Artis brushes, but they ebay dupes are a fantastic alternative, and definitely worth trying – I think I’ll be picking up the full set next! Oh my gosh I really need to try the eBay dupe. They both look incredible but think I would go for the dupe first to see if I liked it. Great review. Great review, thank you for sharing your comparison.